Roughnecks head coach Curt Malawsky was very pleased with the effort his team put forth in an 8-5 win over the Vancouver Warriors on home turf. With the win, Calgary evens its record at 4-4, and moves into a tie with the Saskatchewan Rush for second place in the Western Division. “Going in we were 3-4 and we did enough work early in the season to put ourselves in the position to take the season series in our own rink,” said Malawsky. “This was step one of three. It was very important that we got this one and now we’re pushing ourselves near the top of the standings in our division. It was a good confidence builder for us and you’ve got to win those tight games. Vancouver was strong out of the gate, scoring the first three goals, with two coming off of the stick of sniper Logan Schuss. But the Riggers answered back with two of their own from righties Rhys Duch (2g, 2a) and Curtis Dickson (3g). In the second stanza, the Roughnecks battled a bevy of penalties, but used some quality defence and goaltending to avoid any damage. 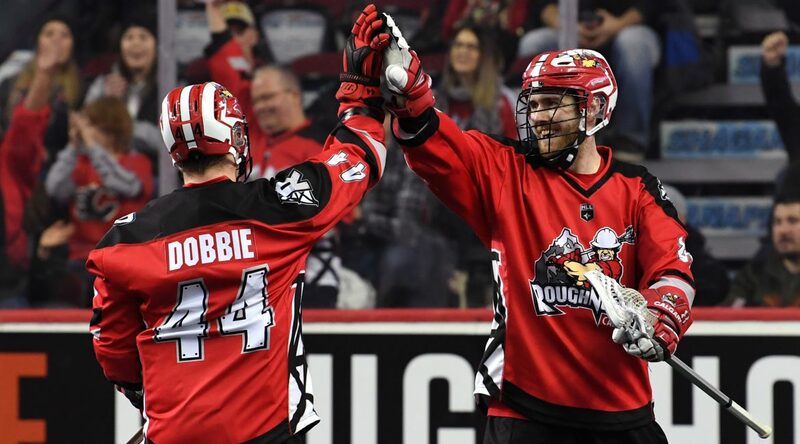 Dane Dobbie (1g, 4a) scored the lone goal of the quarter to narrow the Vancouver lead to one. “Eric Penney played great, but if you watched the film, we were down 4-3 at the half but we had some grade-A chance,” explained Malawsky. “We hit some pipes and we were coming right down the middle of the floor. We preach the process, so you can’t complain that the outcome is not there if you do the process. We just knew that we would grind and grind and grind. That’s a playoff game, we bent and didn’t break. We got a big game player that broke it open for us in Curtis Dickson. After allowing four goals in the first 10:18 of the contest, the Riggers defence settled down and re-focused, shutting down the Warriors offence completely. They allowed just a single shot to find the back of the net over the next 49 minutes of play. Sticking to their game and a simple mentality helped them hold down some incredible shooters. They say that good defence is the best offence. In this case, a great back-end provided some extra chances down the floor in transition. “A guy coming off of the bench went to Dobbie and there was a perfect screen, so in that scenario I had to let it fly and hope for the best and it worked out,” Wilde explained. The Riggers will be back in action next Saturday, Feb. 9, in Saskatchewan to take on the Rush (6:30 p.m.) at the SaskTel Centre.